Published July 31, 2018 at 9:01 a.m. 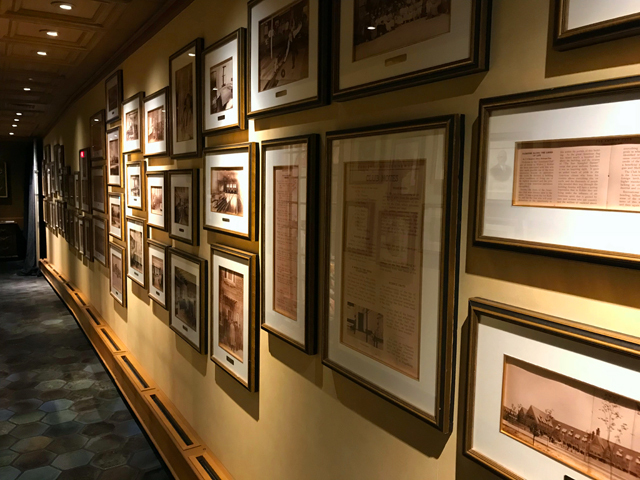 In these times when immigration is such a divisive issue in our country, the centennial of The American Club in Kohler is a good reminder of the role immigrants have played in the United States. With patriotism always top of mind, the young Kohler Company eagerly hired new arrivals and treated them in a way precious few other employers did. In fact, it built The American Club in 1918 as a place for company workers to sleep, eat and find safe, fun recreation. 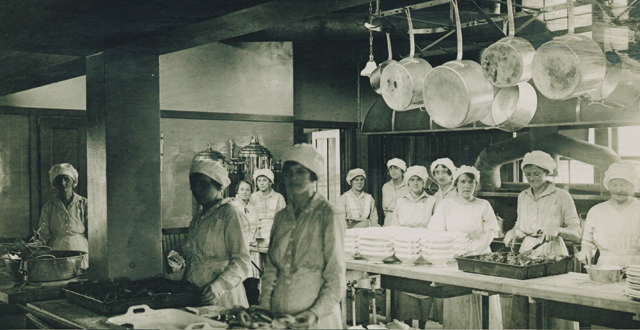 Kohler himself would say that foundry work was so challenging that workers needed a good night's sleep and solid meals. And, the company encouraged its immigrant employees to study English and apply for the for their "first papers" ... a key step in the process toward becoming citizens. 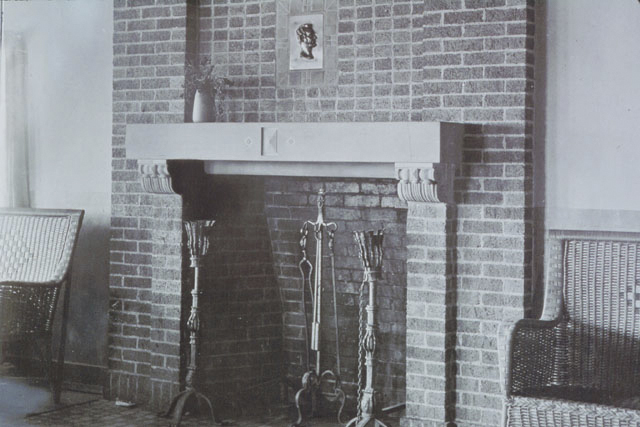 The Lincoln Room fireplace, which looks pretty much the same today. And as the Kohler Company now prepares to honor 100 years of the American Club – now a five-diamond resort – with a massive celebration on Sunday, Aug. 5, with a parade, an ice cream social a speech by Executive Chairman Herbert V. Kohler, Jr., fireworks, a special multi-course dinner at its top restaurant – called The Immigrant Restaurant – and a performance by Grammy-award winner Amy Grant, it hasn't lost sight of the immigrants that built the company and the town. The first such immigrant was John Michael Kohler himself, who arrived with his family from Austria at the age of 10. In 1873, he bought his father-in-law's Sheboygan enameling company and grew it into the Kohler Company, an internationally recognized brand headquartered in an eponymous village. In 1900, Kohler moved his company to rural Riverside (as the village was then named), west of Sheboygan, and built a factory there. Despite the fact that the plant was destroyed by fire within a few months, Kohler kept producing merchandise for his customers and he opened a brand new factory a year to the day after the fire. Hoping to create something of an arcadian industrial utopia, Kohler tapped the Olmsted Brothers firm to draw up a plan for a garden community at the factory gates and toured garden communities in Europe in 1913 with Milwaukee architect Richard Philipp and Garden City movement founder Sir Ebenezer Howard. Five years later, Philipp designed The American Club, a tudor gem constructed of red brick manufactured six miles west of the village, and expanded it not long after. With a bowling alley, dining hall, barbershop and other amenities, the building's bunks rapidly filled with employees. Kohler also welcomed working families to his new community and offered to pay the labor costs for any employee who wanted to build a red brick home in the new town for his family. By 1941, The American Club went public, with its mess hall transforming into The Wisconsin Room and its rooms available to anyone, though employees remained there, too, at reduced rates. The building continued to operate in this way until 1978, when it closed, and a few years later reopened as a resort hotel. In the 1980s it was greatly expanded and earned its first five-diamond rating. Company archivist Angela Miller, part of whose job is to interview employees to help record the company's ongoing history, says many employees have worked at Kohler for decades. The company's quarter-century clubs is known as one of the biggest in the world. "We have a lot of people here whose families have worked for Kohler for multiple generations," she says. "And everyone who has worked here has touched this building in some way." The company has long embraced its history and today you can see an impressive museum on the lower level of the Kohler Design Center across the street, and in the American Club itself, there's a heritage wall (pictured above) lined with vintage photographs and copies of naturalization papers of employees. Nearby, a large wall-mounted screen scrolls more historical images. 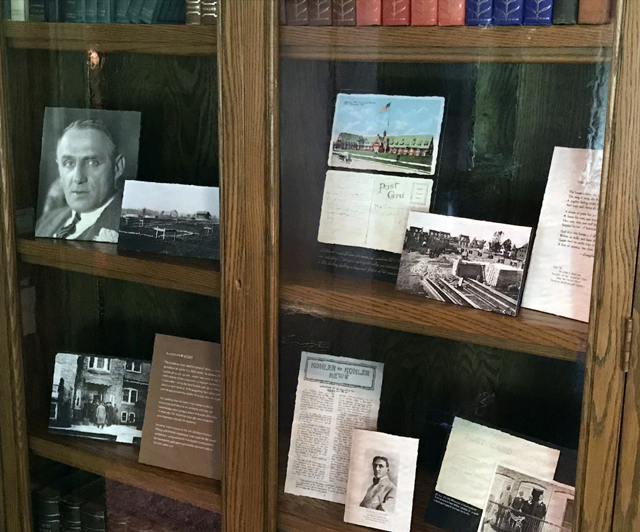 Upstairs in the library, which itself used to be a dormitory for workers, glass enclosed bookcases hold more old photos, documents and memorabilia. Lest you think that the ritzy vibe at the 186-room American Club these days has led the company to forget its immigrant roots, look no further than the work that sculptor Stephen Paul Day created in 2016 in the company foundry across the street as part of Kohler's Arts/Industry Program. 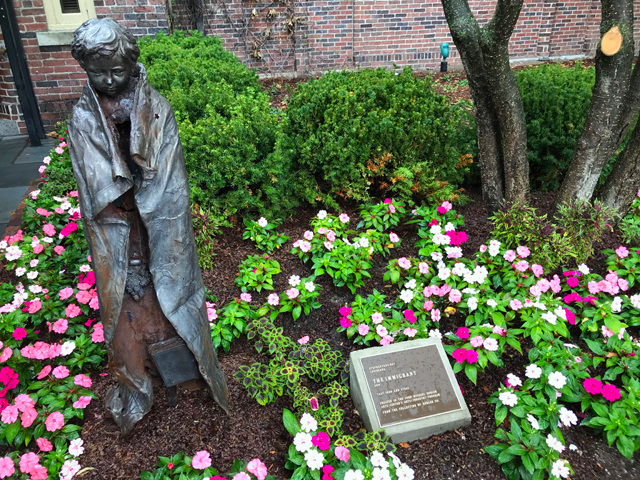 Called "The Immigrant," it is a powerful three-dimensional portrait of 10-year-old John Michael Kohler fresh off the boat from Austria and it greets every arriving guest as it stands next to the front door, a compelling reminder of the American dream. 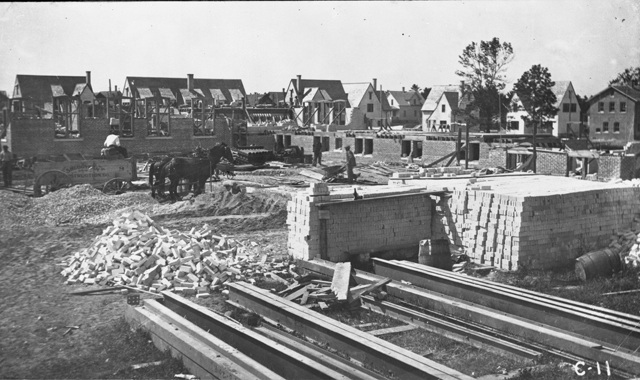 1913 – Walter J. Kohler, Sr. tours garden cities in Europe with Sir Ebenezer Howard, father of the Garden City movement, inspired a 50-year master plan for Kohler Village growth. 1917 – Ground is broken and construction begins on The American Club. 1918 – Thousands of local residents to tour The American Club and hear Walter J. Kohler, Sr. officially dedicate the building. The club provides room for 112 men to live, offering 82 private guest rooms and 13 double guest rooms. 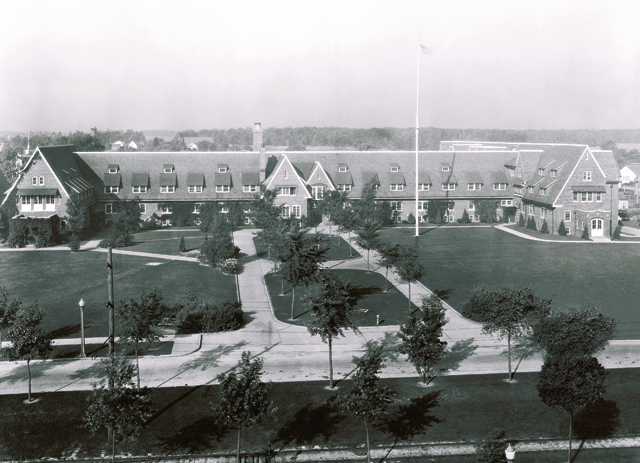 1922 – Work begins on the north wing addition. 1924 – Addition complete. The American Club now has 210 rooms – 169 singles and 41 doubles – providing space for 300 associates to live. The American Club has its own garden and relies heavily on the Kohler Farms to provide fresh food for associates. At a typical meal, diners consumed 150 pounds of meat, five bushels of potatoes, 50 loaves of bread, 11 pounds of butter, 13 gallons of tomatoes, nine pounds of sugar and more. 1916-30 – 854 men and women of Kohler Co. take out their first papers to become American citizens. The first "Naturalization Day" also known as "Americanization Day" is April 7, 1916. On this day, 128 men take out first papers to become American citizens. It is then decided to make this an annual event. The company provides transportation to and from the Sheboygan courthouse. 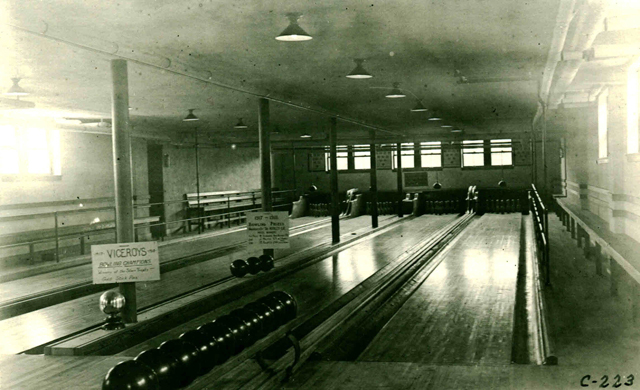 1918-26 – The American Club bowling alley averages 32,000 games per year. 1933 – After the repeal of Prohibition, a 64-ounce "tulip" of beer costs 25 cents. 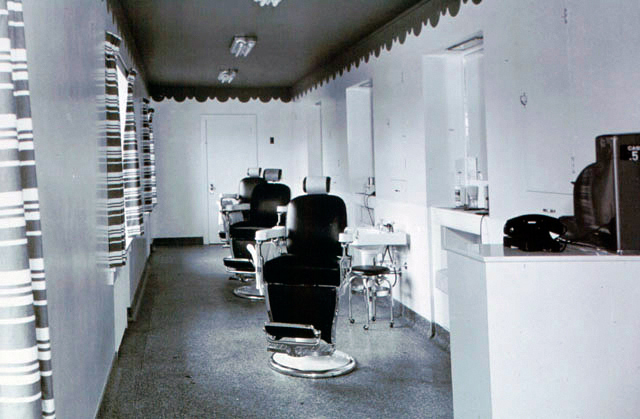 1941 – Herbert V. Kohler, Sr. oversees renovations updating guestrooms and incorporating private bathrooms. 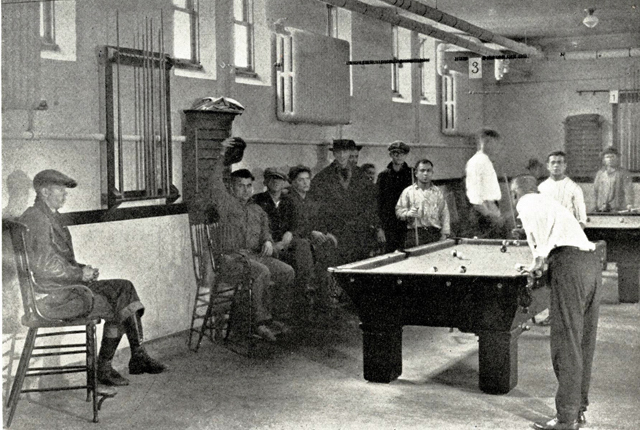 During this time, the cafeteria is updated and renamed the Wisconsin Room, the bowling alley is moved closer to the tap room, and the cafeteria is moved to what is now The Immigrant Room. The building also becomes a public inn welcoming guests. Every other Sunday is known as "Sauerbraten Sundays" and people line up early to pay $1.25 for the specialty. 1942 – The bowling alley is moved closer to the tap room making it more convenient for bowlers to grab a drink between frames, where a shot and a beer – the most popular order – cost 35 cents. 1978 – The American Club is added to the National Register for Historic Places. 1979 – Construction begins on plan to transform The American Club into a luxury hotel. 1981 – The completely renovated building reopens as a 50-room resort hotel and conference center. The bowling alleys are removed and the wood from the alleys is repurposed and used for tabletops and bartops in the Horse & Plow restaurant. 1982 – A 60-room West Wing I addition opens in 1982. The enclosed space becomes a tranquil inner courtyard. 1986 – The American Club collects its first AAA Five-Diamond Award. The Carriage House, a 52-room annex opens. 1991 – Construction begins on a 75-guest room expansion at The American Club. The hotel hosts the Major League Baseball Owners' Meeting. 1993 – The American Club celebrates its 75th anniversary and the 75-room West Wing II addition is dedicated that same day, bringing the total number of guest rooms to 237 and adding one-third more conference space for a total of 22,000 square feet. The Wisconsin Room restaurant is enlarged by 23%. 2012 – The American Club earns the Forbes Five Star award for 2012.